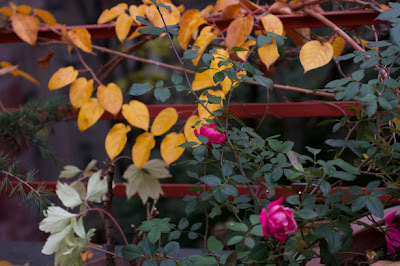 The Last Leaf Gardener: The First Day of Fall in 2012: It is the "BEST of TIMES" (AND) it is the "WORST of TIMES . . . "
The First Day of Fall in 2012: It is the "BEST of TIMES" (AND) it is the "WORST of TIMES . . . "
Today, September 22nd 2012, is "offically" the first day of autumn; and I'm spending it in the throes of the upheaval in my rooftop garden (located in NYC) an upheaval that has interrupted my life, as well as the lives of the 80+ things which I grow here, and the lives of the occasional bee, loner cardinal (who I've now named Cam), and Cam's entourage of house finches, mourning doves and house sparrows. The disruption has thrown my Blogger posting schedule off a bit; and I apologize if you visited me here on days I've agreed to post only to find nothing new; but, as you read along, I'm sure you will realize why this occurred, for, as you know, under most circumstances I keep a schedule I've committed to! 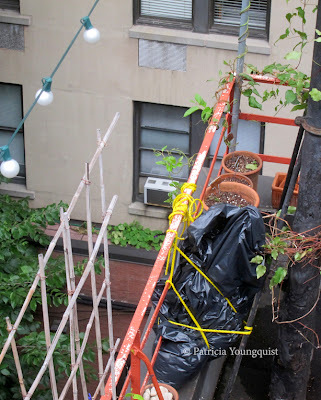 Be that as it may, you my recall that in my last entry here on Blogger, which was Friday, September the Fourteenth, I posted an entry where I discussed a few of the things which I had lost in my garden due to their dying or their need to be relocated. 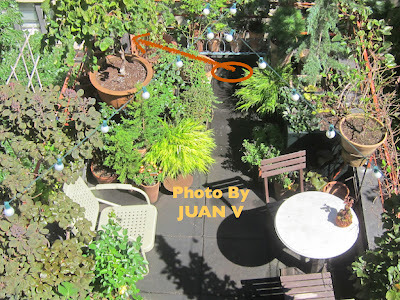 The aforementioned entry included two very similar images of my garden at the top of my posting, and I am including them again today as a follow-up to that posting, where among other things, I mentioned to readers that a couple of the most obvious changes in these garden images is the absence of both my Japanese Larch (Larix Kaempferi) and my Physocarpus opulifolius (Coppertina). The images which I am referring to are the first two images at the top of this entry. 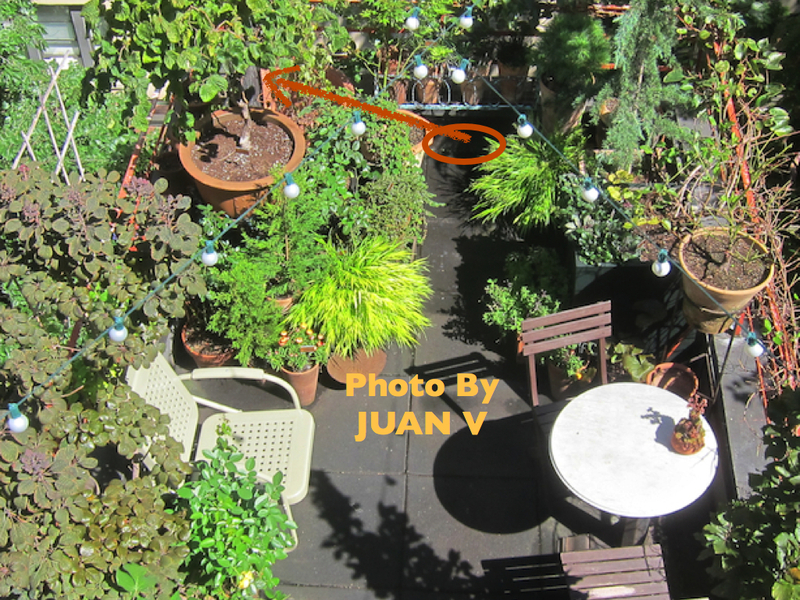 Now, only eight days later, my garden looks completely different; as indicated by the third image at the top of today's post, an image which I took Thursday (September the 20th) afternoon, after my very dear friend, Michael, helped me to remove everything from my terrace's "floor!" 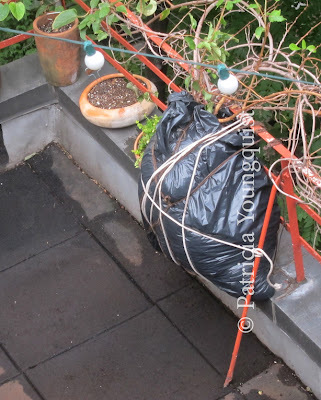 This had to be done as I unexpectedly needed to prepare my terrace garden for a "task" that every container gardener who has their garden on a terrace must eventually confront: this "task" is the resurfacing of the garden's "floor." The workmen who were procured by my landlord to do this "procedure" were due to come to my apartment yesterday morning, and I had to remove everything from the surface of my garden! 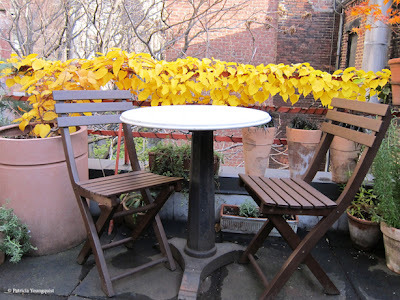 I have over 80 things in my garden (as you may know if you follow me here on blogger, tumblr, Pinterest, Flickr, or Facebook), and a number of them appeared in my first garden themed Virtual Story (movie), titled The Kiwi Speaks! Fifteen Minutes of fame . . . almost, a movie which can be seen in my Vimeo Library. As of this past Thursday night (September 20th), most of the 80+ things that I grow were hemmed inside my tiny studio apartment with me! This included my Avellana corylus (Contorted Hazel Nut), Fagus sylvatica (Beech Tree), Paeonia suffruiticosa (Tree Peony), Acer palmatum ('Shisitatsu' Sawa), 'Tamukeyama' (Japanese Red Maple), Continus Coggygria (Smokey Bush), as well as my "Chelsea" Larch. 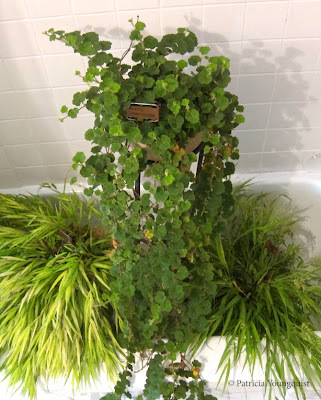 I've written about all of these trees and shrubs here on Blogger, and if you'd care to read about any one of them, please refer to the labels that are located in the left side-bar of this blog, and click on the topic which interests you. 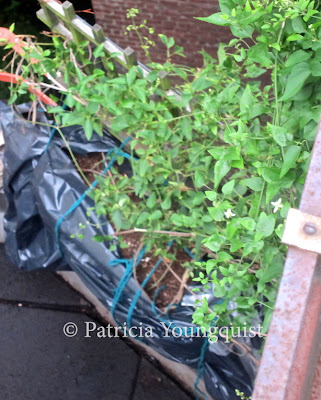 Meanwhile, the now empty (and quite huge) containers for my Kiwi Vine, H.F. Young Clematis and my Autumn Clematis were also moved inside my home, while the roots of those vines were wrapped in "body bags" and tied on my terrace's railing! This can be seen in the in the orange and gold circles that I have added on to the aforementioned image. These circles are at the left and right side of that particular photograph. 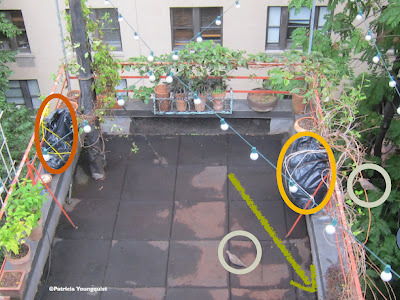 The orange circle at the left indicates where my H.F. Clematis is now hanging in its "body bag." 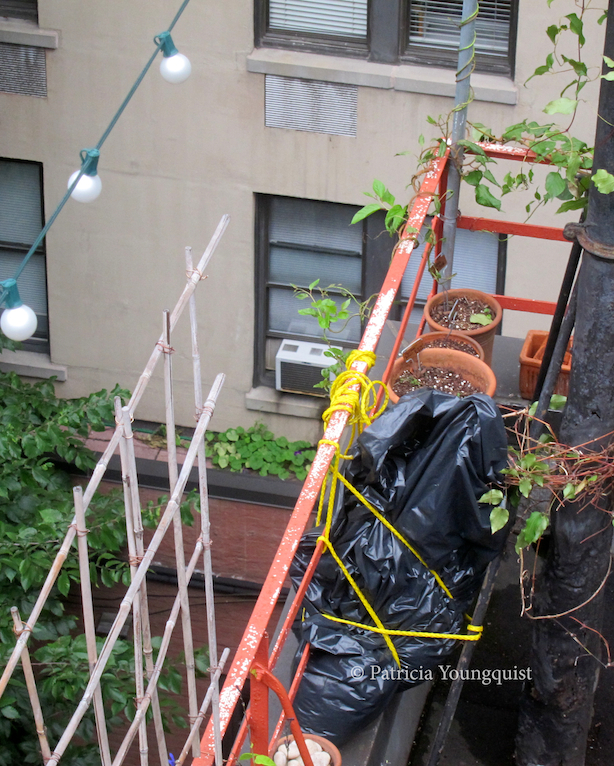 The H.F. Clematis normally "lives" in a container at the bottom of some black pole-like structures (pipes), which are located in the northwest corner of my garden. 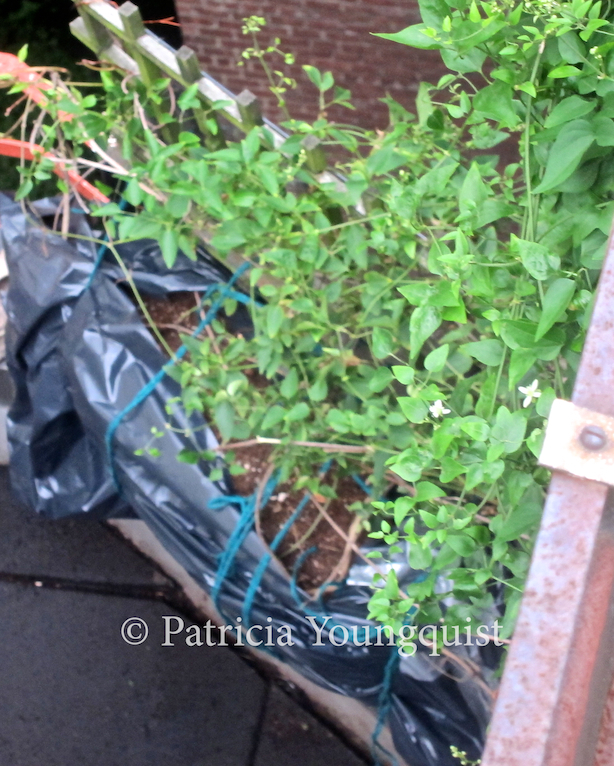 A close-up of this clematis in its "body bag" can be seen below. 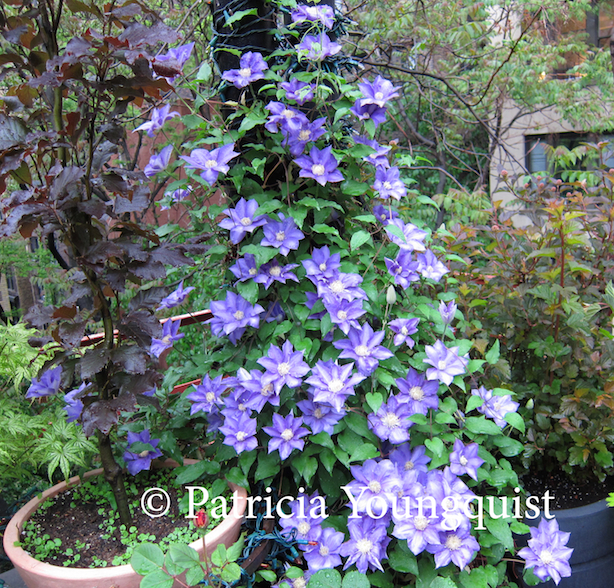 In its "glory days," my H.F. Clematis sports marvelous purple flowers as seen below. 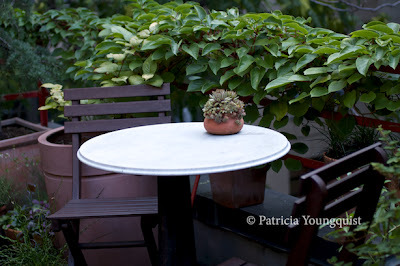 I've written about "my" H.F. Clematis a number of times, including a post here on Blogger, which you may refer to by clicking here. 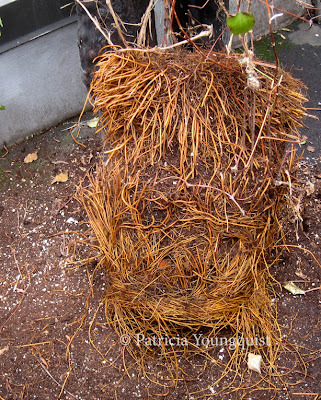 The H.F. Clematis has been in my garden for many years, but Michael and I were still amazed by its root system, which reminded us of Rumpelstiltskin, as you also might conclude from the image of it below; which I took yesterday before Michael wrapped it. The Kiwi Vine, however, has only been in my garden for three years. It has been featured here on Blogger on many occasions, and related entries may be referred to by clicking here. 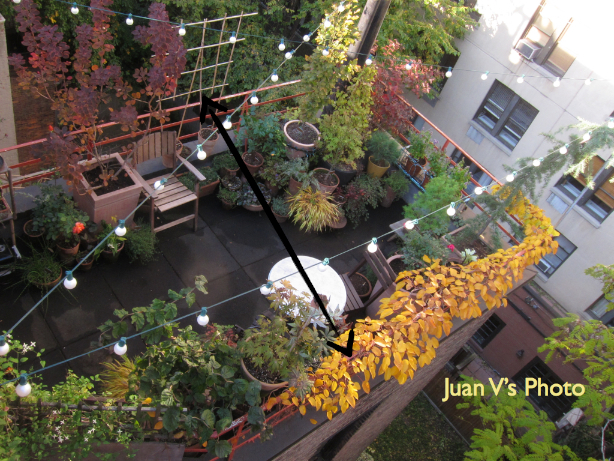 At this time, the Kiwi Vine's awesome foliage is traveling around two sides of my terrace garden railing, as indicated in the second and third images above this posting. This "two way" travel is fairly new (as of this spring). 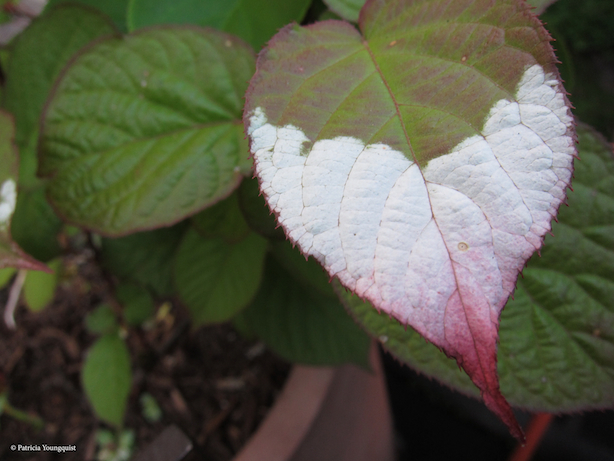 In previous years, "my" Kiwi Vine's foliage's mostly traveled one-way; however, it still proved to be amazing, as indicated by the images below, which were taken over its life so far in my garden. In any event, at the present time, the Kiwi's container is also in my studio apartment while its roots are secure in a "body bag," which is adhered to my terrace railing by strong rope, as seen in the image below. 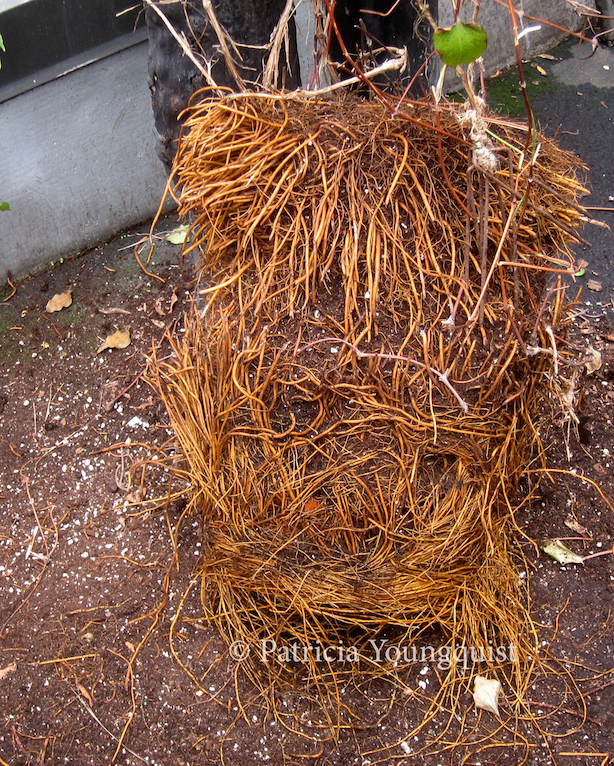 "My" Autumn Clematis is off camera in all of the images at the top of today's posting, but it, too, has its root system in a "body bag," which is attached to the lattice that it "normally" climbs on before heading up the wall. This can be seen in the image posted below. As you may recall, dear reader, the Autumn Clematis had a "featured role" in The Kiwi Speaks! Fifteen Minutes of Fame . 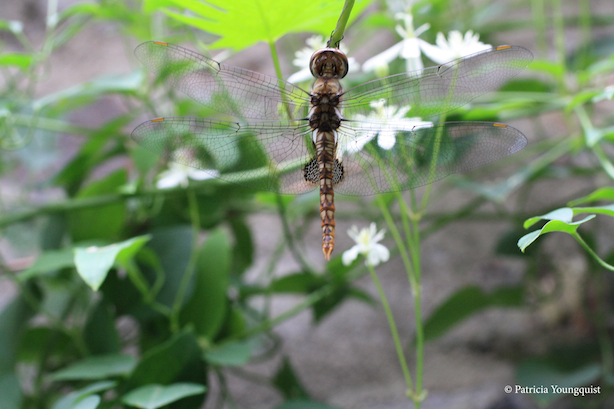 . . almost, but it has also been discussed on my Blogger Pages a number of times, including a post you may refer to by clicking here; a post that documents when she was visited by a dragonfly, as seen in the photo-op below. 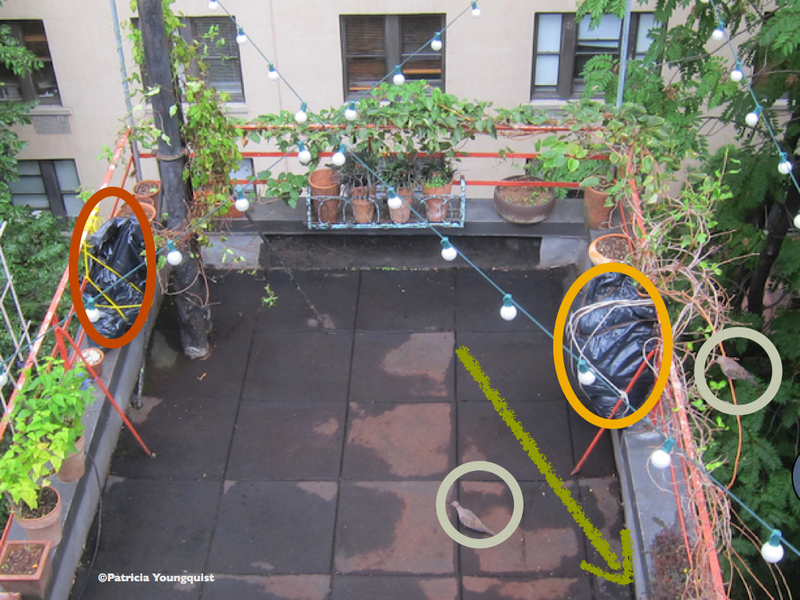 BTW, the two gray circles are "drawn" around two of the mourning doves from Cam's ("my" beloved lone visiting cardinal) entourage and they are both singing the song, "where have all the flowers gone?" As for the other things I grow, most of them are inside my apartment too, and I put my bouncer chair inside; and the Blue Shag is sitting on it! My easel is holding "my" Farfugium japonicum ('Cristata'), Pyracantha coccinea (Orange Charmer Firethorn), and "my" Thom-Thumb Shrub. In my bathtub, I have "my" Hakanechola Macra (Japanese Forest Grass All Gold) twins "sitting" on either side of "my" Rubus calycinoides (Ornamental Raspberry) as seen below. All of these plants have been discussed here on my blogger pages. You may click here and here respectively to refer to a post discussing them. Additionally, this past Thursday, Michael and I took my three rose shrubs, my tree-peony from Juan V, my autumn moon tree and my two containers of strawflowers down the five flights of stairs of my building, and we walked them to his garden at the church. I probably won't deal with the things that we took there until things are back in place. Meanwhile, I have written about all of the plants I took to Michael's garden in my Blogger Pages, and you may refer to a given post about any one of them by going to the label menu at the side bar to the left of this post, and clicking on the topic of your choice. I may even donate everything I took to his garden, if his space has the right sunlight for these things — and if he wants them! In any event, when Michael and I were preparing my terrace, we were talking about the troublesome prognosis which I have recently received regarding my already much comprised eyesight, something I was born with (as discussed in one of my initial posts here on blogger, which you my refer to by clicking here). Now it appears my much limited eyesight is taking a turn for the worse, and Michael and I were discussing how “my” visiting birds (a lone cardinal and her entourage of mourning doves, house finches and sparrows) had impacted my life. I told him how these birds were helping me keep my sense of humor and how I plan to incorporate them into the books and movies that I set out to produce in my indiegogo project, a project which you may refer to by clicking here. I also told Michael that I was quite concerned about how "my" visiting birds might be affected by the upheaval in my garden! 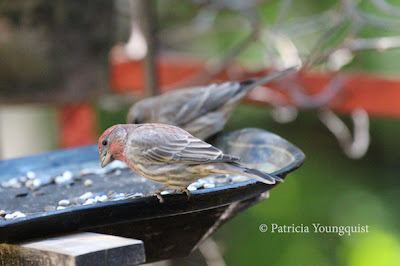 What I did not know, until Michael told me, is that "my" visiting red house finches (seen below) have already endured a big upheaval, and that they have only recently returned to the Eastern Seaboard after nearly being wiped out with an eye disease in 1997! This disease caused “infected birds (to) have red, swollen, watery, or crusty eyes (and) in extreme cases the eyes (became) swollen shut or crusted over, and the birds (became) essentially blind. (When) the infected birds (died), it (was) usually not directly from the conjunctivitis, but rather from starvation, exposure, or predation as a result of not being able to see. Some infected birds (did) recover." The reason that I am bringing this up, dear reader, is that, upon my hearing of the red house finches' struggle to come back to the Eastern Seaboard, I have been motivated to consider bringing the challenges of visual "short comings" into some of my movie and book projects; but I would like to do it through the voice or voices of my red house finches! 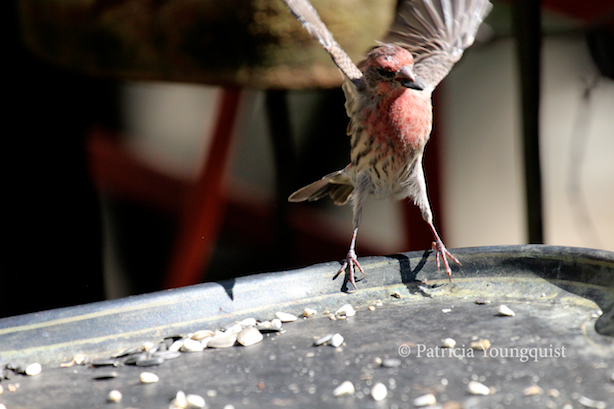 In other words, in my update the red finch would be delighted by my finally addressing this "problem" in my indiegogo project, as, in addition to my mission of this project, I might inspire other visually challenged folks, or, better still, raise awareness about some of the unspoken needs of the visually challenged! should be the voice of my indiegogo Campaign update, where I should perhaps incorporate my eye issues and my need for equipment to realize my goal? I normally don't dwell on my eye problems when it comes to my work, as I would prefer to be "recognized" for my content; and not on "the idiosyncrasies of being visually challenged, yet still pursuing endeavors such as photo-art", an endeavor "normally" associated with sharp eye-sight. But, having said that, I have not made my legal blindness and my low vision issues mutually exclusive from discussing the work I do. As you may recall, I have been interviewed on the radio to discuss how vision loss impacts my photo-art, and I have posted the interviews here on Blogger (in entries you'll find by clicking here and here). Moreover, both of these radio interviews have been included in a designated page of my web-site (Patricia Youngquist Photo-Art); and, I have also included them in the media gallery of my indiegogo Campaign. But still, the issues with my eyes and the challenges surrounding them tend to take a "back seat" in my discussing most of my endeavors. 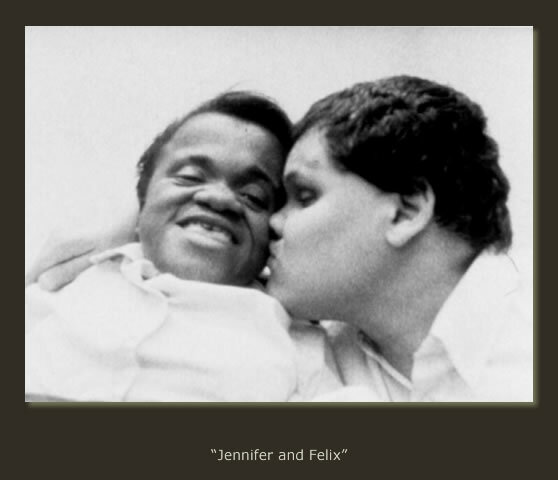 However, in the past, I have donated my services and art work to others whose mission is to raise awareness surrounding vision loss, such as The Foundation Fighting Blindness, an organization to which I donated one of my black and white photographic prints as mentioned in passing on Blogger in a 2010 post. in a competition for America Printing House for the Blind. So it seems that if I incorporate my vision issues in some of the projects I create, that I will in turn be helping other organizations whose mission is to raise awareness about visual loss! And, besides, the month of October is set aside to raise awareness re vision loss issues, which is perhaps another indicator that I should come out of the closet about the impact of vision loss and not be worried what others will think! 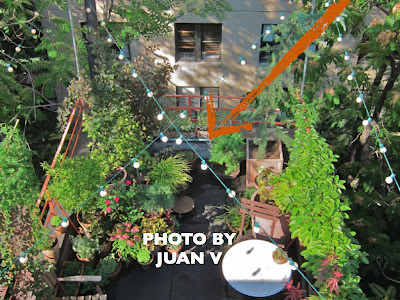 In the coming days, as my garden's "floor" is bring restored, I will be discussing this "angle" with my "experts" on the subject who, of course, are "my" visiting birds! 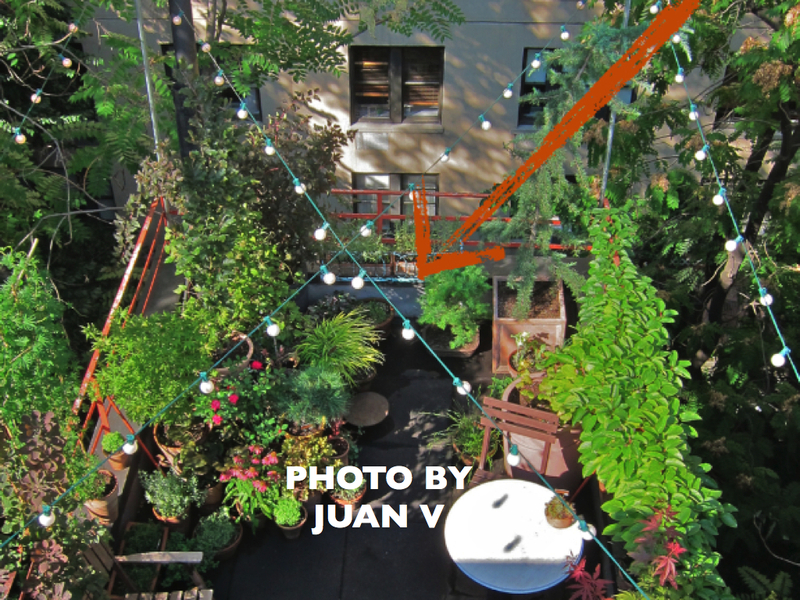 And, after my garden is back to its pre-upheaval state, I may post an indiegogo update, so please stay tuned. Body bag! That has me laughing, plus the graphic images of your clematis and other 'babies' in the body bags adds to the upheaval you are experiencing. However, the vision of your apartment filled with all these plants must be wonderful...though cozy. Your photos are excellent and knowing a little more about your vision issues offers more to appreciate. Keep us/me informed on your journey. Thanks SO much for taking the time to visit my blog, read my saga, and post a comment! I truly appreciate it, Kristen! 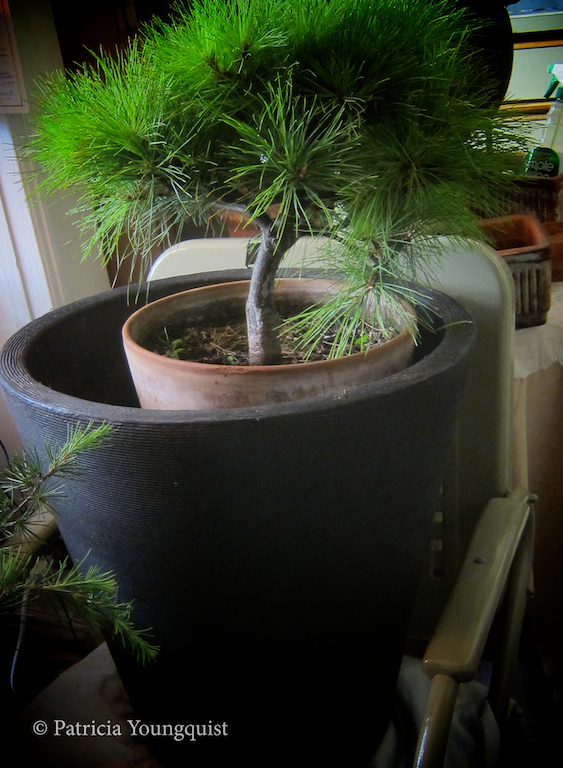 As for it being "cozy" in my small studio, I'm not so sure, did you know that trees and shrubs snore? I did not know trees and shrubs could snore. I've heard that people struggling with vision issues have increased sensitivity with other senses...such as sound! My guess is between the snoring and the studio arboretum tantrums (the japonicum is touching my pot!) you're not getting much sleep. Like all parents, you can be sure your children will be moving out soon! Once again I appreciate your taking the time to read my blog and comment, Kristen! It is support that is much needed at a trying time for me (in issues not mentioned here). Your sense of humor cheers me up. And re "children moving out soon," my sister, who adopted two children from Russia, once was relating a story about her toddler (son) walking into the bathroom while she was taking care of personal matters. Her first instinct was to scold him, but, a thought flashed in her mind, and, that thought was before she knew it he'd be asking her for the car keys! So she just let things be! I love the things I grow a great deal and am focusing on the adventure of our recent slumber party and not the angst! As for your observation that sight challenged individuals have increased sensitivity re other senses, that is certainly the case with me! When I was growing up, my mother used to complain that I had "small town ears," because I could hear everything she said when I was supposed to be asleep! But, my increased ability to hear helps when it comes to getting a photo-op of birds which visit my garden. I just have to aim for their sound as I can often hear them as they are en-route to my garden!